Have hours of fun with these terrific walkie talkies be just like the power rangers and continue their fight against the evil powers of the world. Operation LED and flexible antenna…. Team up with a friend and use these Power Ranger Walkie Talkies. Great inside or outside these easy-to-use walkie talkies are great if you need to contact your friend if you come up against any evil enemies! Or contact each other to conduct surveillance or spy activities on enemy forces to help you defeat them. 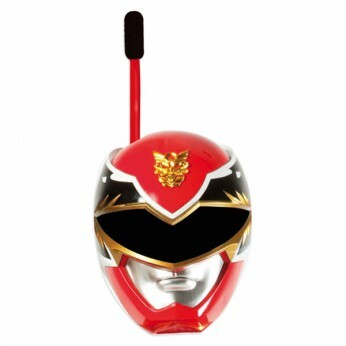 Great for indoor and outdoor use, these easy-to-use walkie talkies are a must for any Power Ranger! General information: Batteries required: 2 x 9V (not included). For ages 3 years and over; EAN: 8421134355200. WARNING(S): Not suitable for children under 3 years old. Only for domestic use. This toy costs approximately £9.99 (for the latest and best prices make sure you check our retailer list for the Power Rangers Mega Force Walkie Talkies above). In our review of Power Rangers Mega Force Walkie Talkies we classed it as being suitable for ages 6 years, 7 years, 8 years but recommend you check the manufacturer specific advice before purchasing.